Like many girls, my mother taught me how to cook at an early age, mostly cakes, cookies, brownies, and pies. Desserts were about it. It wasn’t that my mother didn’t cook, she did, but it wasn’t her favorite thing to do. She worked hard during the day, and cooking was more of a necessity, rather than a passion. 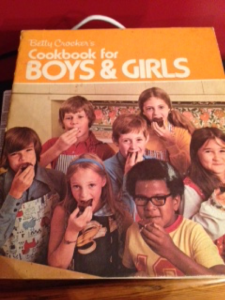 Lucky my mom was, when my Aunt Marion sent me Betty Crocker’s Cookbook for Boys & Girls, and woo hoo, was I in heaven! My culinary talents took off from there, and my mom loved me even more, because now I was able to help with the cooking. What mom doesn’t love it when she comes home from work and a meal is fully prepared and ready to go? It was a win-win all around! Since then, I’ve made recipes from cookbooks, culinary magazines people gift me subscriptions to all the time, and I’ve even created my own recipes from whatever was lying around the cupboard. 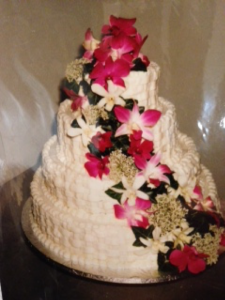 There was a time, before my law enforcement career took off, when I’d hoped to make wedding cakes on the side, but then it seemed like I was working every weekend, which, of course, is when everyone gets married. Here’s a pic of a 4-tiered carrot cake I made for some friends and drove 200 miles with in the back of my mother’s station wagon all the way to Montauk Point on Long Island. To this day, I love making pretty cakes for entertaining, but don’t have much opportunity to make wedding cakes anymore. 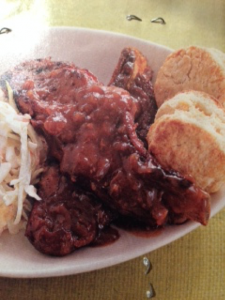 Regardless, I’m still cooking my little heart out and want to share a richly delicious, crazy-easy recipe for spicy country ribs that can be made in a slow cooker, or baked in the oven. Both methods are equally good. I can’t take credit for this recipe. I can’t recall who gave it to me, but it’s definitely “a keeper,” meaning one I’ve made many, many times. Combine the onion, ketchup, vinegar brown sugar, salt, Worcestershire, chili powder, and oregano in a 4- to 6-quart slow cooker or, if baking in the oven, a large Dutch oven. Add in the ribs and cover with sauce. Cook on low for 6 hours, or on high for 3 ½ hours. If baking in the oven, bake, covered, at 350 degrees for 2 ½ hours. If desired, spoon off any fat that accumulates on the surface of the sauce, then thicken with cornstarch and water if you want a thicker sauce. Personally, I recommend thickening, so that all that yummy goodness sticks to the ribs. Enjoy! Now for the bloopers. Believe me, every cook has one, er, more than one. If they deny it, don’t believe ’em. I’ll set the stage…Thanksgiving, decades ago…my mother prepared an enormous stuffed turkey, and all the fixings. The living room was packed with family and friends, sitting by the fire, anxiously anticipating a bounteous feast. Mom put everything, including the turkey, on the dining room table. 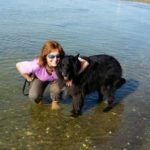 My first dog ever, a Samoyed named Frosty, had a propensity to grab any food left on the counters, so in an effort to put distance between Frosty and the turkey, Mom thoughtfully closed the dining room door, then went into the living room to call everyone in for dinner. A minute or so later, our exuberant crowd charged into the dining room to find Frosty hunkered beneath the dining room table, chowing down on the turkey. Alas, in Mom’s haste to safeguard the turkey from a wayward scavenging canine, she accidentally locked Frosty inside the dining room—with the turkey! Sad, but true. Luckily, the local Chinese restaurant was open and we had Chinese turkey for Thanksgiving. Another Thanksgiving fable, this one not quite so dramatic. We were at my Aunt Babs’s house in Long Island. My aunt tasked me with thickening the gravy, and handed me a jar of cornstarch. I made a slurry, whisked it into the gravy, which failed to thicken. I made more slurry, added that in, only to find the same results. No thickening. Finally, on a hunch, I stuck my finger into the jar of cornstarch, tasted it, only to discover—to my ultimate horror—the jar contained confectioner’s sugar, not cornstarch! Oh my. That was the sweetest, thinnest turkey gravy on record. 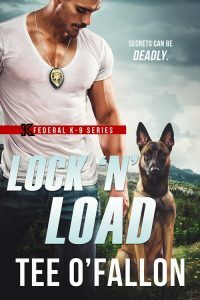 Not only do I write romantic suspense, but I love reading it. I recently started Karen Rose’s Monster In The Closet, and I look forward to seeing how it ends!